Eligibility: Female student pursuing a college curriculum directed toward a career in Applied Geophysics or a closely related field such as Geosciences, Physics, Geology, or Earth and Environmental Sciences. Requirements: Online Application, Current Transcripts, 2 Faculty Letters of Recommendation, Short Essay, and SAT/ACT Scores. Note: While this scholarship is specifically for women, when you submit your application, you will automatically be considered for other SEG scholarships where you meet the eligibility criteria. 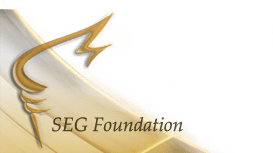 Male students are also encouraged to submit an application to the SEG Foundation. They also offer scholarships for High School students, Undergraduates, and Graduate School students as well as students from countries all over the world.